In 1977, when he was 28, James Atlas published his first book, a biography of the poet Delmore Schwartz, and was stunned to receive a congratulatory letter from Philip Roth. He had been moved by the tragic story it told. Thus began a friendship that lasted, with a few intervals, until his death. He was living in rural Connecticut then, having exiled himself from the literary noise of Manhattan in order to focus on his work, and was on his own. He invited Atlas to come visit, which he did - the first of numerous pilgrimages to the Roth homestead. They remained close for nearly two decades, reading each other’s work, wandering the streets of the West Side - he had an apartment on Atlas’s block - and commiserating about the solitary rigors of the writer’s life. Atlas helped Roth with The Ghost Writer; Roth helped Atlas learn how to live. The snag came when Roth suggested Atlas write the biography of Saul Bellow, and then became unhappy with the result, a book that was sympathetic but also tough - perhaps at times too tough - on its subject. Bellow had become his literary hero. They drifted apart, though toward the end of his life they were both thinking about whether Atlas should write his biography. In the end, they both decided it wasn’t a good idea, but Atlas always knew he would write about him someday. Funny, brilliant, raucous, tender, he was the most charismatic person Atlas ever knew. Remembering Roth is his valedictory. ©2018 James Atlas (P)2019 Audible Originals, LLC. almost didn't listen due to other reviews but glad I did. some said the authors voice should not have been used. there is good and bad to this choice. the inflection and gentleness of the author might have been missed by another reader. he is slightly harder to understand than the professionals we are used to. I put it on 90% speed and enjoyed listening to an imperfect voice read about imperfect lives. like sitting in a rest home listening to a wise old lady...do you tell her to write it down or value her nonverbal cues? Also the subject held my attention more than his speech after 3 minutes. 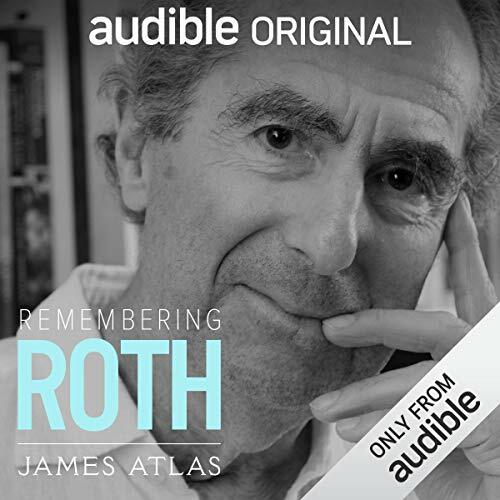 I would obviously recommend it if you want to value your relationships a little more while learning about the world of book writing and what it brought and didnt bring Phillip Roth, one of the best of his time. I am a huge fan of Phillip Roth and thought that this book might have some interesting things to tell me about the man. There were some interesting lines throughout this work, but I don't think it was as exciting as I had hoped for. Audible was giving this book away for free, and that's how I came across it. This seems more like a letter written to someone who is admired and we, the audience, are not the intended recipient. If it was written that way on purpose, I'm not sure why we should read it. I would recommend to grab it for free, but probably not worth the monetary investment. James Atlas tells an interesting story but his reading voice is like listening to someone with wet marbles in his mouth. All spitty and garbled. I had to stop listening or lose my mind. Couldn't get into it due to the narration. I found his voice distracting and that led me to not enjoying the whole thing. The book was read by the author, which should not have happened. No sure if the person has a speech disorder, has a difficulty speaking .. I could not understand parts of it and the overall experience was poor - I could not focus on the story. Sexual abuse is not fodder for jokes. Boo. Don’t even think of listening to or reading this garbage. Phillip Roth's works have always been good for a quick laugh or two, and the personality he showed as a writer in his books made it in here. The narrator bugged me. It felt like he had a slur or something, and didn't emphasize much, giving this whole thing a flat emotional tone. Not sure if the narrator can really help that, but it made this difficult for me regardless. And thank you Audible. A lovely depature for my library on this rainy March 1st. I've never been a big fan of Roth. Seems like his need to be clever and unfiltered is a bit too evident in many of his books. He appears to be going for self-aggrandizement, self-promotion, at the expense of narrative and the "inner truths" guiding human existence. But, of course, we're all like that sometimes. Hell, even I plead guilty to going off in that self-absorbed direction every once in awhile.